I think most of us have some kind of phobia of one sort of another. Trying to understand someone else’s phobia if you don’t share it is often difficult to do. I have friends who are extremely bothered by spiders, for instance. It’s a real phobia that they have and they would probably be the first to admit their fear of spiders is a bit irrational. Now, while I can’t say that spiders are something I particularly like, I don’t really get all that worked up about them. As long as they aren’t involved in some fast moves aimed at my direction that is. If they are just sitting on the wall or in the middle of their webs, minding their own spider-business, that’s OK with me. I draw the line at them living inside with me, though. Being the murderous kind of person I am, if I find them sharing my home I can quite easily just swat them to death. But if it’s not too difficult, I can kindly show them the door, without much squirming or screaming on my part. Maybe I’ll be making one of those faces you make when touching something icky, while I do the removing. No, spiders are not my phobia. Mice either (unless they are involved in that moving-rapidly-towards-me action). No, my big phobia is the telephone. I don’t mean the telephone itself, I don’t mind telephones or even the actual part involving conversation on a telephone. But having to pick up the phone and make the call – that’s the really difficult part for me. When I still lived in New York City, back in the olden days of the 1970s that were pre-digital, and the newest, coolest gadget one could own was an answering machine, I was a freelancer. That meant that I didn’t need to get up early every day, get showered and dressed and go out the door to travel to work at the same job every morning. I worked from home. But in order to rustle up new work, as a freelancer, I had to make telephone calls. And that’s where my telephone phobia kicked in. I would have to call art directors at ad agencies or publishing houses to see if I could wrangle an appointment to come in to show them my portfolio. And it was so hard for me to do! I had to develop methods to get around my fear of picking up the phone and making that call. Sometimes I would call my mother. She spent her days sitting at her desk in an office so she was pretty much always available. Calling my mother was outside the bounds of my fear phobia so it was easy. We would talk for a few minutes about pretty much nothing important and as soon as I hung up, I would make my other call, without giving my phobic brain time to kick in. I think part of my phobia was founded on my fear that I would not remember what I wanted to say and that I would just end up babbling stupidly into the handset. So my other tactic was to write down on paper my entire spiel – often starting with “Hi, my name is Hilarie Cutler and I’m an illustrator”. I don’t know why I had to write that down. Was I afraid I would forget my name? Anyway that’s what I would do. I would write down everything I was planning on saying. Even thinking up in advance, answers to what they might possibly ask me. 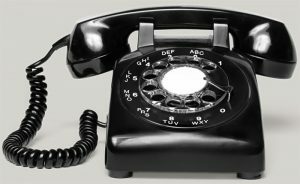 Then I would sit in front of my phone, with the name and phone number of who I was planning on calling in front of me on the paper with what I was going to say, for however long it took me to actually pick up the phone and dial the number. Sometimes I would sit there for an hour or more working up the courage, or whatever it was that I lacked, to make that call. The odd thing was that once they answered the phone and I had to actually talk, there was rarely a problem. The phobia was over. I rarely have a problem talking. And the whole process of going out to the interview with my portfolio case in hand was not a problem either. I actually liked that part: going outside my place, taking the subway downtown, walking into the posh offices, going up to the receptionist and telling her who I was to meet and having the meeting, was all rather fun. It was that first step of picking up the phone that was the problem. It even applied to calling friends – so hard to just pick up the phone and dial their number. By the time I left New York in 1987 to move to Stockholm, I thought I had pretty much licked my picking-up-the-phone-phobia. I could do it. And then I found myself in a completely new country with a new language. A language which it took me a while to learn to speak (not being one of those linguistically talented types who pick up a new language in weeks) Here in Stockholm, most people who I would need to call actually spoke very good English so the not-speaking-Swedish part shouldn’t really have been a problem. Nope. The real problem was that the phone phobia thing was back, in all its glory. And I had to start all over again, from the beginning. But that was almost 30 years ago and I managed to find ways to deal with the phone. It rarely involved calling my mother. She was a very expensive phone call away. It frequently involved getting my Swedish husband to make the call for me. I am now able to make those phone calls, in whatever language is required, when I have to. It still does take me a while to work up the “courage” to pick up the phone but I don’t have to write down the phone number on a piece of paper anymore. It’s usually programmed into my smart phone these days. And I don’t have to write down what I want to say anymore (though I sometimes discuss with my Swede just how to say in correct Swedish what I want to say). But lately, something else is going on. It’s been over a year now since I stopped working my staff job as designer at IGBP. I am for all intents and purposes, officially retired. I don’t have to get up to go to a job anymore. I don’t even have to get up and make phone calls to rustle up work any more either. I basically don’t have to get up. And there lies the problem. Three days ago I didn’t get up. I stayed in bed all day. Never got dressed. Never even brushed my teeth. I know some of you might say, “Well, good for you! It’s nice to just relax once in a while.” But relaxing was not what I was doing. I spent most of the time with my eyes aimed at my smart phone, reading Twitter, Facebook and occasionally the Outlander sub-Reddit. Checked my email but it was mainly junk to be deleted. Tried reading my Kindle for a bit. I kept dozing off. Till I finally decided to take a nap and then all I did was lie there unable to fall asleep. I wasn’t relaxing. I was playing dead. I told myself that tomorrow would be a better day. That tomorrow I would be able to engage again. But I wasn’t really sure I believed me. I think I was having problems picking up the phone. To get up out of bed, to get dressed, to brush your teeth, you have to believe that it’s worth doing. I think my belief was wavering. I was having a lot of problems answering the big question, WHY? What is the meaning of life? What is our purpose? Why are we here? Why bother? My mother used to tell me, “Hilarie, you just think too much.” And she was probably right. Most people just get up and go about doing the stuff they do in their lives, without needing to ask why. The day after my lying-in-bed-all-day-day I got up. I got dressed. I brushed my teeth. I went out. My cat needed me. My son needed me. My husband needed me. The people and organizations I’m involved with needed me. So I guess its just a matter of picking up that phone and making that call, one day at a time. This entry was posted on Friday, June 2nd, 2017 at 10:40. You can follow any responses to this entry through the RSS 2.0 feed. You can leave a response, or trackback from your own site. Nothing profound to offer, just to say that I’ve always had the Phone Thing. As you did, I wrote out scripts, including my name. You never know what you might forget to mention! My son also has the Phone Thing (damned inherited traits! ), and I have a coworker who felt uncomfortable on the phone. I will say, it has become easier in my old age.